How the rest of the world see us. 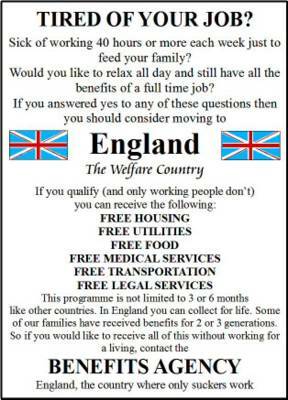 Here is a spoof advert that a friend from Australia “claimed” was in their local newspaper. Although I find it hard to believe – knowing what I know about Aussies – there is a fair possibility that it was! Spoof Advert sent to me from Australia. Perhaps it is time we should examine closely exactly how our system works. Not a politicians knee-jerk reaction, but maybe to put together a team of experts to examine our whole benefit structure. It doesn’t have to report tomorrow, or even next month. 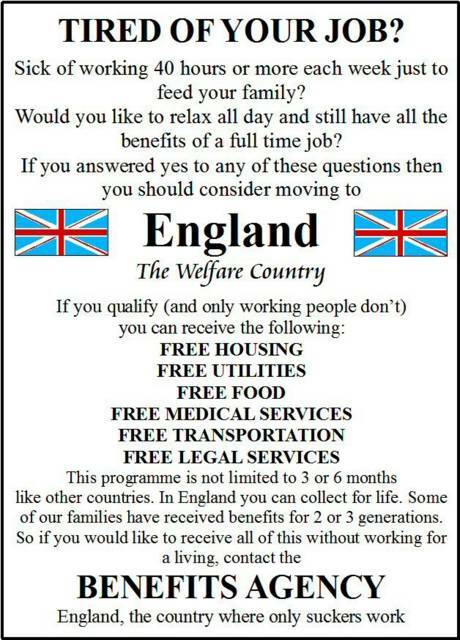 Have them take a year to really study our whole structure and put together something else which won’t stop genuine applicants being looked after, but would make it difficult for (a) illegal immigrants to take benefits, and (b) new immigrants perhaps to work for a year before they can avail themselves to a totally free service – possibly by charging them what they can afford to pay. If they are out of work, they’d pay nothing. Illegal immigrants should not have to suffer medically, but perhaps have special clinics for them to attend where the clinic does not have to pass their details to the authorities. I am not saying that the above would be good in any way, and also you may have totally opposing views. But it is only by putting forward these ideas that people who think differently can put their ideas forward and we can arrive at the best solution. This is something the extreme left and the extreme right are not happy with – it is called “debating”. In November 2004, Tony Blair’s government announced plans to bring in compulsory ID cards – the ‘Identity Cards Bill’. even make you carry it at all times. The government wants powers to charge you for being issued with an ID card. It also wants to be able to charge you for a card for your children as young as five years of age. The cost of each card is tipped to be between £35 and £85. if any information held on you is wrong and needs correcting – even if it’s not your fault! It will also cost the taxpayer over £5 billion (£100 each) to bring in ID cards – enough to pay for fifty new hospitals! 3. It won’t stop terrorism. Many terrorists use their real identity – the Madrid bombers and the New York hijackers (‘9/11’) all had valid ID cards! The idea that having to present an ID card at a police station would stop street crime does not hold water, any more than making motorists show a driving licence at a police station stops car theft. Spain and Italy have ID cards, and both continuously experience illegal immigration. ID cards are hardly a deterrent! 5. It won’t stop DSS fraud. Most benefit fraud concerns false claims on circumstances, such as income. Only a small percentage concerns identity – and the money involved is tiny compared to the cost of introducing ID cards. 6. It won’t be fool-proof. The ‘biometric’ technology is not fool-proof – China has abandoned plans to use it for ID cards. Failure of an ID card computer system could even deny you the use of public services you’ve paid for! Criminals can get around controls by stealing or forging ID cards. The more we depend on a card, the greater will be the incentive. Maybe it’s the government that has something to hide? 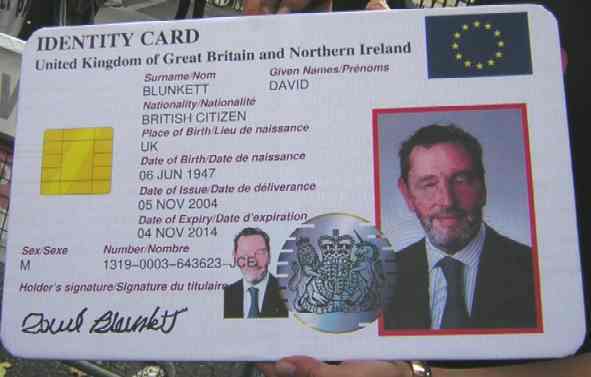 Mr Blair keeps quiet that the government agreed to EU plans for ID cards (a.k.a. ‘smart cards’ or ‘entitlement cards’) in 2000 – a year before ‘terrorism’ became the convenient excuse. The government then ran three expensive public consultations after ‘9/11’ to whitewash this decision- and rigged the results of one consultation to claim that the public was in favour by 2:1 !! 8. The public is not so keen. A knee-jerk opinion poll after ‘9/11’ showed 85% of those asked would approve ID cards. However the percentage drops massively when people learn more about them – in one poll, only 18% were happy to pay even £30 for a card. This mirrors the experience of Australia, where public opinion turned against ID cards. Plans for ID cards were dropped. The government wants to record every time we use an ID card to get public services – and talks of us also being tracked when we use commercial services (e.g. banks). The experience of a country like Spain is that ID cards are a bureaucratic inconvenience to the law-abiding majority. Would you be happy, as a law-abiding person, to queue up at a police station to have your eyes scanned, and fingerprints taken like a criminal? Is there a better use of precious police time – like tackling drink-drivers or burglars? Would you be happy to be fined £1,000 for forgetting to tell the authorities about every small change of personal details? The above has been “lifted” from the website of New Alliance. I haven’t asked, but the site owner – Brian Mooney – is a stirling chap and I am sure he would only be too happy providing I gave a link to his site. Which I have beowl.